Flying in video games has always fascinated me, whether it’s jetting around as Iron Man (which was the only great thing about that game) or soaring higher into the clouds in Owlboy. I’m always up for taking to the skies, and thankfully developer Serenity Forge is fulfilling that experience with The King’s Bird on the Nintendo Switch. Who doesn’t want to play a game about someone with the ability to fly and adding in the art style of paper cutouts with beautiful backgrounds and charming aesthetic? 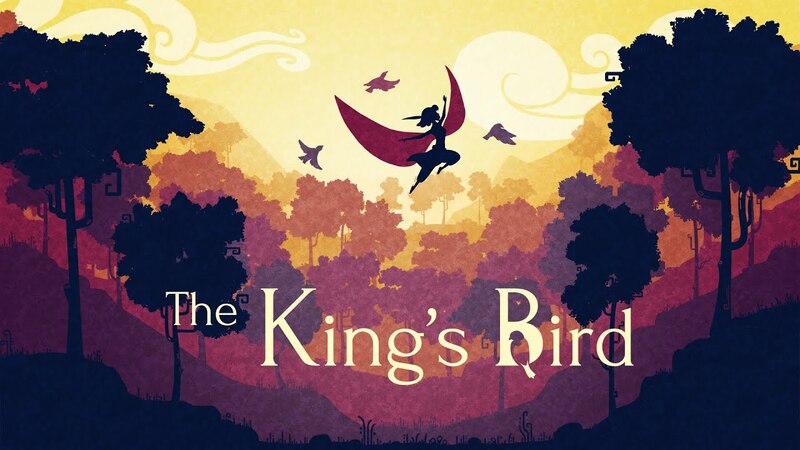 The King’s Bird is a 2D side-scrolling platforming title with flying elements and features a gorgeous art style. Graphics should be hit on first as that is one of the elements that makes The King’s Bird stand out. The rolling and tumbling antics of the main character flow vividly and the animation is fluid and almost life-like in a sense. The title does look phenomenal with an excellent mix of some type of gradient color work with subtle changes in the style as you climb and fly through the environments. How the developers handled the movement of your character, and the layering and depth in the game world that’s in a 2D plane, but a good amount of it is played in the shadows like Inside or Limbo that make it special. As you fly and jump through your playthrough you’ll see that they chose an excellent color palette of darkness fading into the light in the background and every time you get to a checkpoint, when the light bellows out from the tower, there’s a sense of satisfaction that truly delivers in the graphical style. Gameplay is handled with realistic animations that have a Prince of Persia-like feel to the movements. Despite many levels moving at a faster pace trying to fly quickly to a destination, is balanced out by the slower parts where your timing is essential for surviving risky jumps. Fluidly moving throughout the environments felt great and while I wish the jumping wasn’t as floaty, you did have a great amount of precision in how you would land a jump. The graphics and gameplay meld exceptionally well together to make for an enjoyable experience and great presentation throughout your time. While gliding and flying throughout the world, the music is handled with aplomb and has a ‘big’ type of style most of the time. There’s rarely a moment in The King’s Bird where the sinister overtones of what’s actually occurring or what world you’re inhabiting are interjected interjected into the musical score. Instead, most are large orchestrated arrangements with a center around percussions and radiating out with a wide range of instrumentation. What I really appreciated was the unique way the protagonist interacted with the music and how it plays a central part in the narrative. When you begin flying your character sings out this melody that matches up with the overall tracks perfectly and matches with the title of The King’s Bird. While I wish there were moments of subtle instrumentation and dark undertones, I can hear what the developers were going for. In the end, this makes The King’s Bird soundtrack stand out from the many more melancholic and melodic musical scores that we’ve seen multiple times in other games with similar art styles. The music plays so much of a part that when you finally enter an area and hear no music, just the hum and ambient noise of the sound effects, I can’t help but be surprised. Some of the tracks may not match exactly with what’s going on with the screen, especially with the overall mood, but many times the music is filtered in a way to remain with you even past your time playing. The way wind effects reverberate through the corridors you jump and fly through is exhilarating and provides equal gravitas for each well-times jump. The audio design builds on an emotional resonance that I think works very well for telling the story. One area where The King’s Bird may be lacking is with the story and narrative components as there is not much here. You start out by learning the gameplay mechanics in a few small sections as the story is told out with occasional small cut-scenes about a world ruled by an evil king and you having to try and escape. What works well with The King’s Bird though, is both the simplicity of your characters abilities in combination with the levels’ intricacies. For example, you can run, perform a short burst, and fly, and everything in the game is a combination of those different gameplay mechanics. Bursting is an essential functional to master and will be your primary way of getting past obstacles and moving successfully throughout the environments. If you burst and then leap off of a hill, you will begin to fly for a limited amount of time. Everything resets when you touch land, which result in some breathtaking moments like flying through a series of hazards and obstacles, touching in one safe spot and fluidly flying to the next safe area. It’s in this way that the controls are similar to the stellar Celeste, although not ever reaching that high of a level with platforming. As great as the gameplay is, my main gripes center around the control. While The King’s Bird does control extremely well, some actions do not feel as responsive as I would like. There were a few times where I would fail a section, not because of any lack of skill, but of my inputs slightly off of the presses when jumping. Movements are elegant and simplistic, but also don’t always convey what you mean to perform. Checkpoints are liberally sprinkled about, but some safe areas were too spread apart or at other times too close of being any consequence. This would sometimes cause me to die for no reason, even when it didn’t look like I touched anything which was somewhat frustrating. The King’s Bird is a title that caught my attention with its graphical style, but had an equally impressively gameplay loop that was enjoyable and fun to experience. Even with a few missteps, this is the type of title that lacked almost any kind of frustration for mistakes in the controls. The tangible feeling of a reward from nailing a difficult jump and landing in the exact right spot never got old and The King’s Bird never outstayed its welcome of roughly 6-7 hour length.